Windows do not cause condensation. 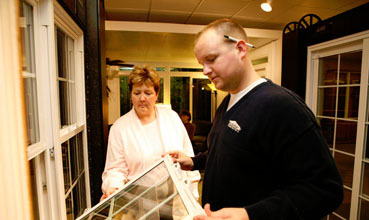 Windows serve as visible areas for moisture to condense, warning you that there is too much moisture inside your home. Of course windows don't manufacture water. If you were out in the desert, you'd want a canteen, not a window. But people seem to believe that windows do manufacture water. They call up window contractors and say "My windows are all wet and it's the fault of the windows." Well, not quite? Water on windows is condensation, and it can be a problem. However, it's not a window problem, and the solution does not come from the windows. What causes window condensation, and what can you, the homeowner, do about it? More and more homeowners are concerned about growing condensation problems and they are growing. There are several explanations for this last remark. And for the most part, they can be traced to "progress." For example, the "tight" construction of newer homes, the increasing use of modern labor saving appliances, certain building materials, smaller homes, more gas furnaces, and additional showers. A little fog on the corners of your windows shouldn't bother you. And it probably doesn't. But "problem" condensation- fog or moisture that covers whole windows should bother you. These visible effects are just the tip of the iceberg. What is happening elsewhere in your home? In your attic, excess moisture may be freezing in the insulation, where it will later melt and damage your plaster or drywall. Or perhaps it's forcing its way out through your siding, where it will form blisters under the exterior paint, or it may be promoting unhealthy mildew in your home. Humidity comes from excess water vapor in the air. All homes have a certain level of moisture due to the household activities. Activities, such as cooking, laundry and dishwashing can add up to five pounds of water vapor into the air daily! Other moisture-producing agents include plants, heating systems and humidifiers. Seasonal changes, quick changes in temperature, reconstruction and remodeling can also add excess humidity temporarily into the air. During construction, large quantities of water are displaced into the air from building materials such as concrete, plaster, taping, etc. After one season of heating it will commonly dry out and your condensation problems will disappear. Today's technology produces more energy efficient, "tighter" homes. This is great for keeping your home more comfortable, quieter, and cleaner, but by sealing your home you are also keeping moisture in. In today's home it's very easy to build up extremely high levels of humidity. Does the Amount of Condensation Depend on the Type of Window I Have? Sometimes recessed windows like bow and bay windows usually experience more condensation than other window styles. This is because air circulated around those windows types is usually more restricted, and since they stand away from the insulated house wall, bays and bows could be a few degrees cooler in temperature. To diminish condensation, a smart installer will insulate under the seat and head of the unit. As a secondary measure, placing a common electric fan near the window to produce air circulation may also be helpful. Be sure all ventilation to the outside is functional. Use kitchen and bathroom exhaust fans. Consider installing a laundry room exhaust fan. Run exhaust fans while the humidity-producing appliance is operating or the humidity producing activity is going on, and let them run a while after the activities have ended. Air out your kitchen, bathroom and laundry room during or just after use. Because outside air usually contains less water vapor, it will "dilute" the humidity of inside air. This takes place automatically in older homes through constant infiltration of outside air. The process of heating your home will reduce the relative humidity provided it's dry heat. It will counter balance most or all of the moisture produced by modern living. If you have a furnace humidifier or other humidity device in your home, be sure it is adjusted to produce the proper amount of humidity, or turn it off. The humidity produced elsewhere in your home may mean these devices are not needed at this time. Remember...by reducing the humidity in your home you will eliminate most, and probably all, of the condensation! Please enter the number 64776 in the box provided below.